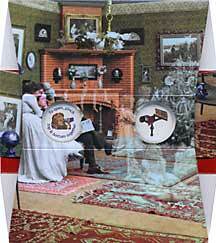 We've added color to this 1901 Underwood & Underwood stereo view, originally entitled Anticipation: Visions of the Future, to enhance the sense of dropping in on a newly married couple in their richly-appointed living room over a hundred years ago. As the young couple contemplates their first Christmas tree, we see what they imagine: the ghostly images of children yet to come. The children they anticipate could be our grandparents, great-grandparents, or greater still (depending on your age). "May the Spirits of Christmas Past, Present and Future Be with You And Yours This Year"